Today was religious Rome and some ancient Rome thrown in for good measure. 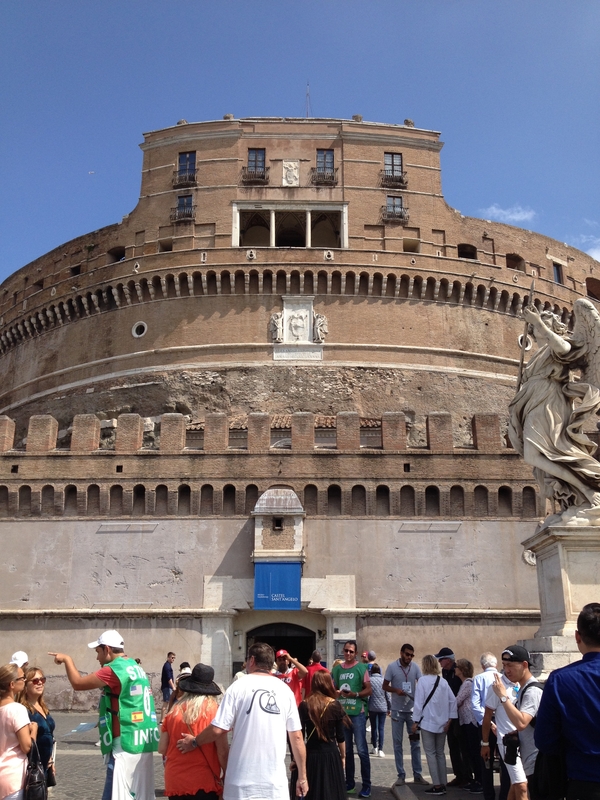 We started out at Castel Sant’ Angelo. We got a Roma Pass and we have used the heck out of it. In addition to free or discounted admission to many attractions, you also get free use of the Metro train, bus, and tram system. It’s great. Castel Sant’ Angelo was built in about 135 AD as the tomb for the Emperor Hadrian and his family. It was later converted to a military fortress in the fifth century. It is also where popes fled to in times of turmoil. There is an underground passageway connecting the Vatican to Sant’ Angelo making it very easy to flee from marauding invaders. Each pope created his own apartment in the Castel making its interior very opulent despite its foreboding exterior. It’s quite the combination of the sacred and the profane, or the excessive and the spartan. Prison cells alongside papal extravagance. Very interesting place. Crowning the top is a sculpture of the archangel Michael sheathing his sword. The symbolism is that the angel ended a plague and they put this sculpture here in appreciation. There’s a killer view once you make it to the top. 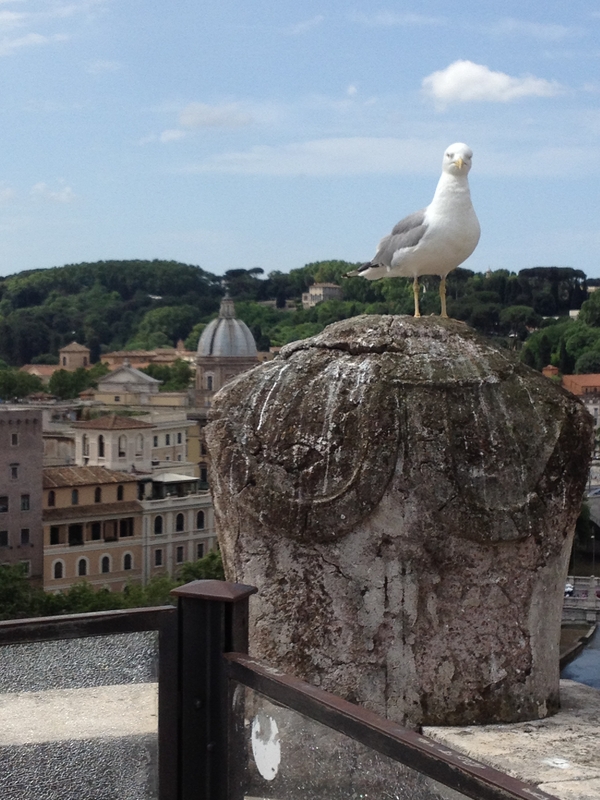 Rome is a beautiful city and has a very interesting skyline, thanks to St. Peter’s. No building in the city can be taller than St. Peter’s, so you have great views over the low buildings and domed churches. So when you have a bird’s eye view, it’s really spectacular. After Sant’ Angelo we had a quick lunch in another very forgettable place. I really hate wasting a food opportunity in Italy – it really pains me to have sub-par food in a land known for its cuisine. But you do what you have to do. We were in touristy area and didn’t have time to search out a good place. So we grabbed what we could and made our way on. Yuck. We had 1:00 reservations for the Sistine Chapel (I highly recommend this) and scooted past the line and into the Vatican Museum. Easy-peasy. To say that it was crowded in there is an understatement. Wall to wall people all making their way through the priceless treasure trove of art and antiquities that the church has plundered over the centuries. All to culminate in the Sistine Chapel. Looking up at the center of the chapel at the hand of God gently touching Adam’s finger is a tremendous feeling. Something you’ve seen pictures of hundreds of times, but seeing it here, in this place, is moving beyond words. And there is Adam draped across that rock that Michelangelo saw in his childhood and Hunter stood next to just last week. There are no photos allowed in the Sistine Chapel, but my rule-respecting grandson snapped a couple of clandestine ones. I couldn’t have been more proud. We left the Chapel through a secret door that we discovered years ago thanks to Rick Steves. You’re supposed to exit to the left, but there’s a door to the right that’s reserved for tour groups. Just blend in and go out that door and you’ll avoid the long (about a mile) walk back to St. Peter’s. And when you go out of the building, you’re right on the front steps of St. Peter’s, avoiding the ridiculously long lines that snake around the side of it. St. Peter’s is another site to behold. The largest church in the world, it’s simply gorgeous. It’s so big it can accommodate the crowds, except when they all gather around the major sites, like the Pieta and the Bernini canopy housing the chair of St. Peter. It’s a very holy place and I think even non-believers or those of other faiths find some kind of reverence there. Although I did see a young Asian couple having a water fight in one of the holy water fonts. We toured the crypt where all the popes are buried and then made our way out of the Vatican City. As we walking back to the Metro, we saw a police raid on the some the black market street vendors. Several police motorcycles came barrelling down the street and the vendors grabbed as many of their knock-off handbags as they could and ran for the hills. The cops pursued and we’re not sure if any offender was nabbed or not. It was quite the drama, all in the shadow of St. Peter’s. Life goes on. Our next stop was the Baths of Caracella. They were built in about 212 AD and were used until the 500’s. They think about 6,000 people visited the baths each day. I guess the Romans were a clean bunch. They were free and open to all. The ruins are amazing. It’s huge and included not only baths, but had libraries and social areas as well. They now have concerts and performances with the ruins as a backdrop. Not a bad place for seeing an opera, or even a rock concert. On the way back to the apartment, we stopped at our favorite gelato spot and sampled some more flavors. I had celery and ricotta and pear – it was very good. The celery was clean and bright and very refreshing. Hunter had his standard strawberry and lemon and Steve had ricotta and orange. All great. After cleaning up and resting (I had over 22,000 steps on my tracker), we decided to go to Nonna Betta in the Jewish Ghetto for dinner. We thought we would walk over there and maybe take a cab back. What we didn’t know was there was a huge concert in Circus Maximus and every road around us was blocked. Even to pedestrians, which I still don’t understand. We thought we’d walk away from Circus Maximus and get a cab. Steve had a bad blister on his toe and was in a little pain walking. We got a cab near the Colleseum and the cab driver drove right into the mess at Circus Maximus. It was a parking lot. We decided to bail on the Jewish Ghetto and just eat in our neighborhood again. Problem was we thought we had cash, but it turned out we didn’t. Steve got out and looked for an ATM while the cab stopped in the road. We got lots of dirty looks and horns blown at us, but the cab driver was not bothered. Finally Steve came back with cash and we hopped out and found a restaurant in Testaccio. Not what we expected on our last night in Rome. But the good thing was the weather was fantastic and we had a nice meal outside in our quiet little neighborhood. What I feel like after a week in Italy!